Pittsfield Historical Society – "for the benefit of Pittsfield"
"for the benefit of Pittsfield"
More People of Note . . . The Railroad Depot in 1913, 1974, 2008. Pittsfield · Somerset County · Maine · U.S.A.
—’Juniper’ in The Pittsfield Advertiser, December 30, 1886. The history of any town is not a single history but rather a fabric of the sum of thousands of histories all woven together. And like any woven fabric, the details of each warp and weft are all but ignored when we view the fabric as a whole. Yet it is the strength, integrity, and color of each thread that makes the fabric what it is. To single out merely a few histories in an attempt to tell the full story of a town must of necessity fall short of the mark. Yet in the recounting of any story, there are always those parts which remain untold, or perhaps glossed over, or perhaps entirely forgotten. Sometimes this is is because for decades at a time the story tellers themselves are unaware of the blinders they wear, unaware of their own biases toward telling some stories and ignoring others. Other times pieces and threads are truly and completely lost, there having been too feeble an attempt, if any, to preserve that story through photographs or written record when it was fresh. Generally it is hard to view “today” as “history”—today is “now”; history was “back then”. 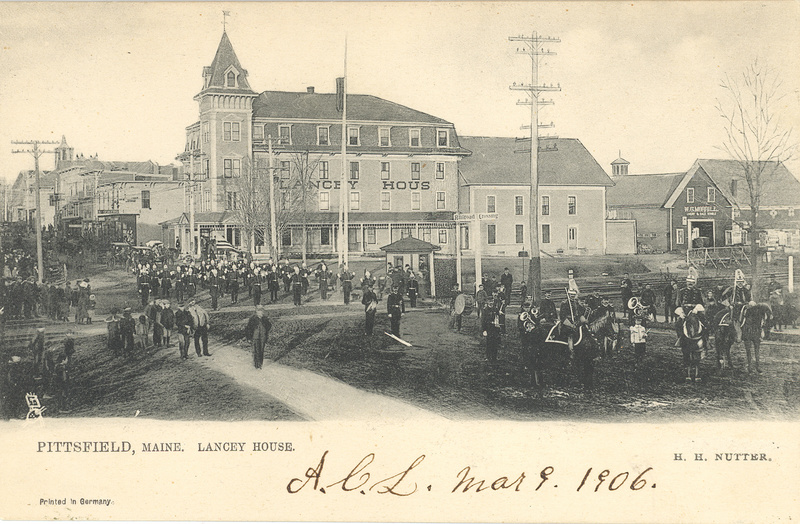 But whether we gaze at the 1906 celebration in front of the Lancey House or at the photos of Eisenhower’s 1955 visit to Pittsfield, we can’t help but think of how to those assembled on those historic days, what is history to us was their “now”, too. Today we are grateful for those who in the past had the forethought to record those events, as well as to those in the interim who cared enough to continually preserve those records up to the current era. For someone who just moved to town, what happened in 1990 is part of Town History, yet for folks who grew up here that era was just a few yesterdays ago. 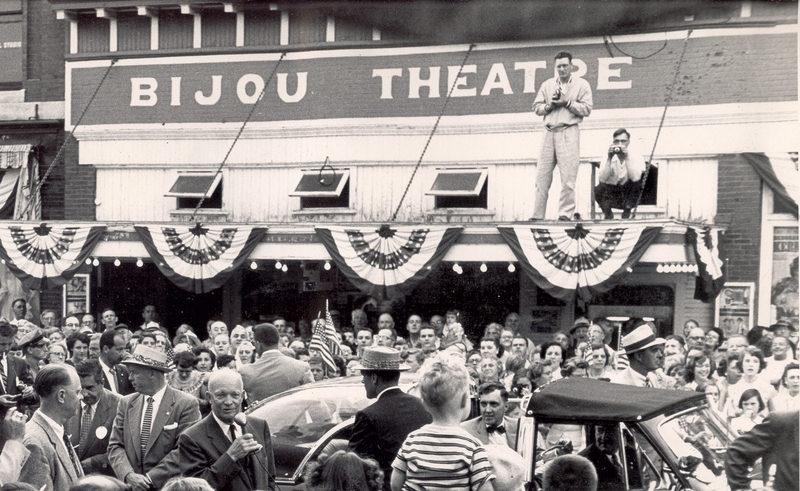 The more you look into your town’s history, the more you realize that for the people living in every era, they weren’t living in history, they were just living their own “today”. It may therefore behoove us to reward future generations of historians by keeping good photographic and written records of what the town looked like and what happened way back in 2017. While we can never thank the folks who took town photos back in 1917, we can pay our gratitude forward to the folks who will study our town’s history in 2117. It is in this spirit that this website attempts to retain and provide easy access to a wide variety of histories of the town, some in recent memory and some that once resided only in the memories of great-grandparents. Some threads are about “important” people and events, while others are contributed by “regular folks” and describe everyday events. They all come together to create the fabric that is Pittsfield—as they always have. Our greatest thanks needs to be directed towards the dozens of Pittsfield residents who, over the past two centuries, have recorded and reported upon scenes and events in our town. Without their efforts each era of the history of Pittsfield would fade with the passing of each generation. With their help, however, we are able to recount images and stories of how we got here, of what has come before any living memory can recall. This website is an effort to continue telling that story to ourselves and to future generations. The Pittsfield Historical Society was formed in 1983 in a community effort to preserve and protect some of the town’s most valuable assets: its history and artifacts. Pittsfield’s past is rich in the history of a mill town, beginning in its earliest days as a wilderness hunting expedition site, to the first mills erected on the Sebasticook River that winds its way through the downtown area. Some members offer a significant and substantial offering to our history; others quietly affect the background musings. We listen to others’ impossible dreams, (and create a few of our own), lend a hand with repairs, unravel mysteries, research genealogy, catalog artifacts and pictures, and unobtrusively capture the essence of a part of our New England heritage. Whatever your capability, your interest is the key. Help us write the history of Pittsfield! This site is constantly growing. In these pages you will find several locations listed with little or no history given. If you know even parts of the history of these locations, please share with us what you know so we can better fill in the history of Pittsfield. Also see the History of Your Place page. Hoping to preserve the way we were, PHS collects bits and pieces of Pittsfield history largely through donated artifacts, photographs, newspapers, family scrapbooks and diaries. By looking at and preserving the way it was, we aspire to keep the spirit of many alive. The local community is wealthy in history scarcely uncovered of a small frontier town, to bustling mill town to the safe, clean New England town we know today. Members of PHS invite you to join us in piecing together the alluring portrait of Pittsfield, Maine, USA. Call one of the contacts listed below or join us as we meet at the Depot House Museum on Central Street.The public is always welcome to join us. Watch the Rolling Thunder Express community paper for our notice! Would you like to get occasional email notices from the PHS? From time to time the society will be sending email notices to anyone interested in Pittsfield Historical Society events. If you would like to be recieve these notices click here to write an email to send us your email address. We won’t share your address with anyone else. The Depot House Museum will be open every Tuesday and Saturday, from 10am to 1pm., or by appointment. The Depot House Museum will be open by appointment. Contact Tom Brown. Meetings of the Pittsfield Historical Society: January through October meetings will be at 7 pm on the third Thursday of each month at the Museum. Click here for Contact Information or to learn more about the Pittsfield Historical Society. There are no trained or experienced genealogists in the society, so callers should not expect too much. Most of what we do have can be found by searching this web site. 4) Provide requester’s name and an e-mail address or, if telephone only, when is the best time to call. Looking for a different Pittsfield? This website is about Pittsfield, Maine. We don’t know much about the other Pittsfields around the country, but below are some links to their historical info. Hope this helps. Town Histories & more . . .
What is the Central Maine Egg Festival? Pittsfield Historical Society | Powered by Mantra & WordPress.